Mushrooms, therefore, are perfect for a fat-bomb-type meal. They are low in carbs, with only 2g net carbs per 100g (3.5oz). We will infuse them with huge amounts of fat for a fantastic Keto meal. 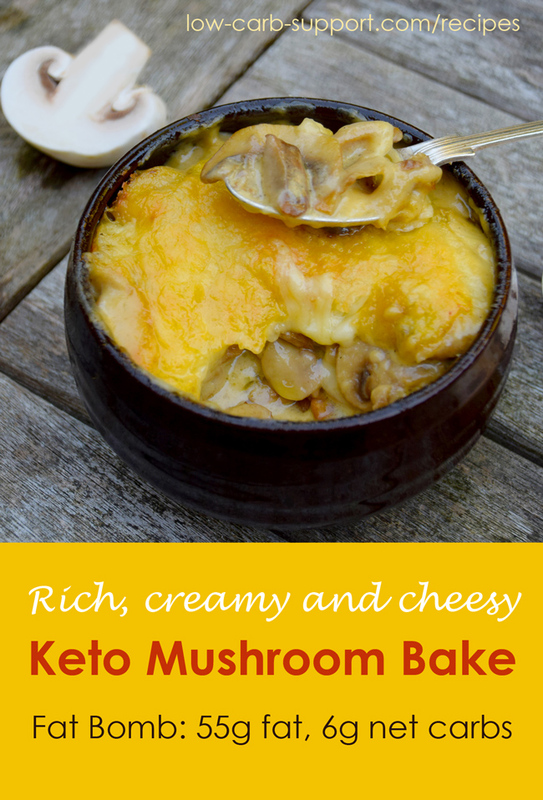 This Keto mushroom bake has a supremely rich and creamy taste, with a layer of golden baked cheese on top. The recipe is simple and ready in about 25-30 minutes. It makes a great Keto meal on its own. Or try it as a side dish, to boost the fat content in lean protein meals like chicken breast or fish. This recipe is inspired by a Russian dish called mushroom julienne. Adapted from the French cuisine but a lot more popular in Moscow than in Paris! “Julienne” actually refers to a method of cutting vegetables very finely into long thin strips. But we don’t have to replicate that exactly for this version. Just any thin slices will do. 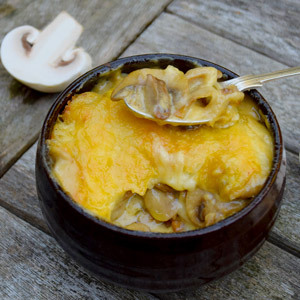 The original mushroom julienne recipe includes white sauce. I experimented and found that we can easily sub white sauce with crème fraîche or sour cream. This adds extra fat and ensures there are no carbs coming from the flour in the white sauce. Mushrooms – standard pedestrian white mushrooms work perfectly well in this recipe. But you could use any other type of mushroom. Chestnut mushrooms, Portobello, forest mushrooms – anything you like. Except perhaps shiitake mushrooms, I am not sure if they absorb as much fat as other types. Butter – any full-fat butter, either salted or unsalted. Grass-fed is better if you can get it. Crème fraîche – this is basically a slightly posher version of sour cream. The reason I buy it is because it has more fat than sour cream – about 30-40% fat versus 20-25% fat in sour cream. Cheese – any grated hard cheese that you would use on a pizza, for example, cheddar, Colby, Edam, Gruyere, Emmental or provolone, on their own or mixed with grated mozzarella. I just used cheddar and it was wonderful on its own. Garlic – 1 clove of garlic is entirely optional – only if you like the taste. Mushrooms guzzle salt as eagerly as they guzzle fat. They also reduce in size when cooking to a great extent. If you add the salt in the beginning, you might end up with very salty mushrooms. So it’s best to season the dish once the mushrooms have reduced to their cooked volume. Boost this recipe further by adding extra ingredients to the mushrooms. I am thinking something like sliced bacon, pancetta or ham. Maybe chicken meat? Other veggies like courgettes, aubergines and peppers would work too, but fry them first. Please remember to adjust the nutritional data provided for this recipe if you change or add any ingredients. Slice the mushrooms into thin slices. It will look like a big heap of mushrooms but they reduce in size to about a quarter of that once cooked. Melt butter in a frying pan and fry the mushrooms for about 10-15 minutes, until golden brown. When mushrooms are almost ready, season with salt and pepper and add garlic if using. Add crème fraîche to the pan and mix well until all mushrooms are covered. 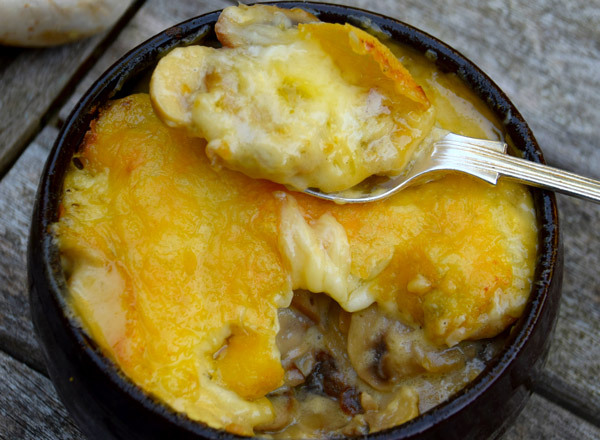 Put mushrooms into two individual ramekins and top with grated cheese. Do you need more Keto recipes? Try these great cookbooks. What so you bake it at? Can you put onions in it? You can make a bechamel out using cashew milk and almond flour. I figured this out on my own. The change in ingredients doesn’t have a major change in flavor either. Plus you can have soufflés again! Interesting! I haven’t tried it with cashew milk, will give it a go. Thanks for sharing this tip. Can I swap butter for coconut? Or it has to be a butter? Hi, butter does add an extra note of rich and creamy niceness… But if you would rather use coconut oil, go for it – I am sure it will turn out well anyway. Good luck! Would love more keto and low carb recipes! !